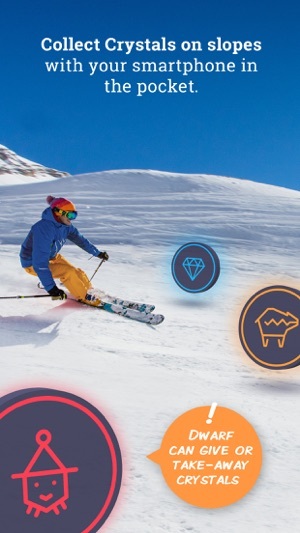 Smart app to get more ski fun! Feel like a local from day 1. 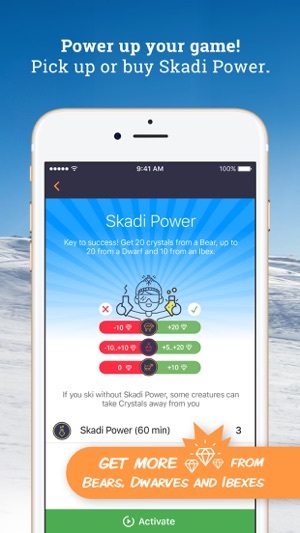 Ski with Skadi to new places, collect crystals, catch marmots and exchange them for privileges, bonuses and gifts from Skadi’s partners. Join Skadi Ski Club to get more privileges. It couldn’t be simpler to discover great skiing. Skadi creates Ski Safari tours with customized routing plans that are tailored to your abilities and preferences. Whatever resort you’re on, Skadi has it covered, giving you the kind of access to great trails and spots that you would only get if you were a local. All you need to do is input your ability level and route preferences, pop in your earphones, and go with the snow. You’ll receive prompts and directions that will guide through your route. And the app works offline, so you needn’t worry about losing connection. And there’s more. Each route has its own story, and as you ski you will be able to participate in our unique virtual feature. In this adventure mode you will be faced with creatures of the snow, and will be able to collect crystals and gather strength and experience. 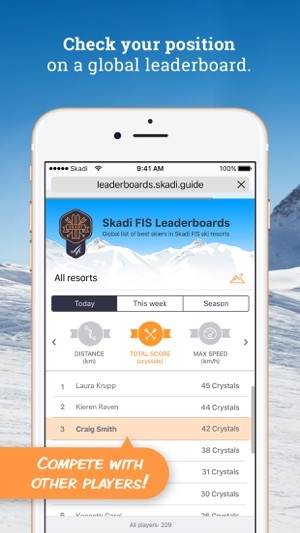 “Skadi is the perfect tool for helping you get accustomed to a new resort, especially big resorts with hundreds of pistes. Now I know I can't get lost while I explore the mountain and I can always find the best spots, even as a beginner!” - Emma. SKADI converts ski resort to a magic playground! 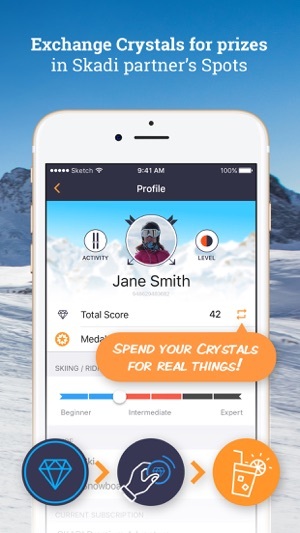 Get more fun from your skiing by collecting as many crystals as you can. Keep your eyes open for magic animals and dwarves that can give or take away your crystals. Happy hunting! SKADI can plan exciting Ski Safari tours especially for you. Experience customized routing plans that give you access to great ski routes and amazing vistas - all built according to your personal skill level and preferences. 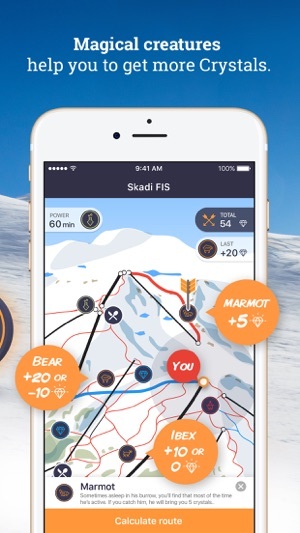 Skadi is your hands free answer to great skiing without the hassle of having to deal with paper maps. Just plug-in your headphones and follow the gentle audio prompts, for a day’s ski that has less map and more mountain! Skadi works totally offline, so you never need to worry about losing a signal. All you need to do is download the map for your resort, and you’ll have instant access to great ski routes that only a local would know. Whatever your ability, Skadi has the right map for you. For every resort you visit, you’ll be able to find a map that suits the level of adventure you’re after. Review and share your skiing experience with your friends. Just tap on an interesting place or object on the map, calculate the route and start skiing there. Should you choose to upgrade to a Premium Membership with SKADI Premium Adventure subscription, payment will be charged to your iTunes account at a confirmation purchase. Your yearly subscription is 14.99 EUR per year. (Price may vary by location.) Your subscription renews automatically unless cancelled at least 24 hours prior to the end of the current period and cancellation of the current active subscription is not allowed. Please note that continued use of GPS on your phone can dramatically decrease battery life.